Rafuse, Ethan S., Typhoid and Tumult: Lincoln's Response to General McClellan's Bout with Typhoid Fever during the Winter of 1861-62, (Journal of the Abraham Lincoln Association, Summer 1997). Rowland, Thomas J., In the Shadows of Grant and Sherman: George B. McClellan Revisited, (Civil War History, September 1994). Sears, Stephen W., Controversies & Commanders, (Houghton Mifflin, 1999). Sears, Stephen W., McClellan and the Peace Plan of 1864: A Reappraisal, (Civil War History, March 1990). Sears, Stephen W., To the Gates of Richmond: The Peninsula Campaign, (Ticknor & Fields, 1992). Sears, Stephen W., The Curious Case of General McClellan's Memoirs, (Civil War History, June 1988). Boritt, Gabor, editor Lincoln's Generals, (Oxford University Press, 1994). Hassler, Jr., Warren W., General George B. McClellan, (Louisiana State University, 1957). Glatthaar, Joseph T., Partners in Command: The Relationships Between Leaders in the Civil War, (Free Press, 1994). Grimsley, Mark, The Hard Hand of War: Union Military Policy Toward Southern Civilians, 1861-1865, (Cambridge University Press, 1995). Houser, Martin Luther, Lincoln and McClellan, (Courier Printing Company, 1946). Kelley, William D., Lincoln and Stanton: A Study of the War Administration of 1861 and 1862, with Special Consideration of Some Recent Statements of Gen. Geo. B. McClellan. McClellan, George B., McClellan's Own Story: The War for the Union, the Soldiers Who Fought It, the Civilians Who Directed It, and His Relations to Them, (C.L. Webster & Co., 1887). Myers, William Starr, A Study in Personality: General George Brinton McClellan, (D. Appleton Century, 1934). Sears, Stephen W., editor The Civil War Papers of George B. McClellan: Selected Correspondence, 1860-1865, (Ticknor and Fields, 1989). Williams, Harry T., Lincoln and His Generals, (Knopf, 1952). Williams, Kenneth, Lincoln Finds a General, (Indiana University Press, 1985). President Lincoln maintained his faith in and support in McClellan long after leading members of Congress had abandoned theirs, but by January 1862, Mr. Lincoln was clearly frustrated with McClellan’s inertia. McClellan’s inaction became near paralysis when he fell ill with typhoid in late December 1862. Rafuse, however, contended that “McClellan was able to conduct business throughout his illness, mostly through adjutants, and during the first week he remained quite active.”27 Rafuse noted that McClellan appeared much worse by December 31, then improved a few days later. Coincidentally, McClellan’s return to health coincided with a change in the leadership of the War Department. During the fall of 1861, Edward M. Stanton had portrayed himself as a friend of both McClellan and War Secretary Simon Cameron. When Cameron was dismissed in mid-January, Stanton replaced him and quickly dropped his friendship with McClellan. Stanton told President Lincoln in January 1862: “You are Commander in Chief under the constitution and must act as such or the government is lost….You must order McClellan to move. I think he will obey. If not, put someone in his place who will obey.”34 But McClellan did not move, and Stanton was transformed during 1862 from ardent friend to zealous foe of General McClellan. Historian Richard N. Current wrote: “Having put McClellan in supreme command, Lincoln might well have given him a fair, unfettered chance, but the President could not close his ears to the harping of the Radicals. For months he wavered between the self-interested badgering of the politicians and the professional advice of his general in chief.” 39 However, it wasn’t until early March that McClellan revealed his strategy. President Lincoln was privately skeptical but publicly supportive of McClellan’s plans to shift the Army of the Potomac from the Potomac to the Virginia Peninsula between the James and York Rivers. According to Congressman Kelley, “Without letting any of his friends know where or when the movement was to occur, the President said confidentially that a grateful surprise was preparing for the country, the success of which would restore McClellan to popular confidence. When on one occasion the statement was received with incredulity, he said, with a good-natured smile: ‘But McClellan has, in this case, left himself without a loop-hole through which to escape, for he has said to both Stanton and myself: “If this move fails, I will have nobody to blame but myself.” 40 President Lincoln ordered that enough troops be left behind to protect the nation’s capital – which McClellan would eventually blame for the failure of his strategy. “From the beginning to the end of the siege of Yorktown, his dispatches were one incessant cry for men and guns,” wrote John G. Nicolay and John Hay. 43 No friends of McClellan, the former Lincoln aides wrote: “The simple truth is, there was never an hour during General McClellan’s command of the army that he had not more troops than he knew what to do with; yet he was always instinctively calling for me.”44 Commenting on President Lincoln’s letter of April 9, 1862, Nicolay and Hay wrote that he answered McClellan “with as much consideration and kindness as a father would use toward a querulous and petulant child.” 45 Mr. Lincoln began one letter: “Your dispatches complaining that you are not properly sustained, while they do not offend me, do pain me very much.”46 President Lincoln was responding to McClellan’s requests that the corps commanded by General Irwin McDowell be sent to the Peninsula rather than reserved to protect Washington. Civil War historian Bruce Catton wrote: “McClellan had nearly all of the gifts: youth, energy, charm, intelligence, sound professional training. But the fates who gave him these gifts left out the one that a general must have before all others – the hard, instinctive fondness for fighting. Robert E. Lee was one of the most pugnacious soldiers in American history, and McClellan himself did not like to fight. He could not impose his will on the man who stood opposite him. He was leading an offensive thrust that had taken him to the suburbs of the southern capital, yet it was just a question of time before the initiative would be taken away from him.”48 Plagued by a “siege mentality” of warfare, McClellan had a habit of overestimating the Confederate forces he faced and underestimating his ability to move expeditiously against them, but he was a workaholic and superb organizer who had the unquestioned loyalty of his troops. Historian Thomas J. Goss wrote: “Worse for his longevity in the Union high command, the ‘Young Napoleon’ was never reluctant to express his opinions and rebuff Lincoln’s effort to align their contrasting views on the war’s conduct. That McClellan had a coherent, though flawed, view of the war was most clearly outlined in his famed Harrison’s Landing letter.”54 That letter, which General McClellan handed to President Lincoln when he visited the army headquarters on July 8, contained the general’s presumptuous advice on how to conduct the war. Lincoln biographer Richard J. Carwardine wrote: “Lincoln pointedly refrained from any response, save cool silence, and so gave eloquent indication of what he had in mind.”55 Unfortunately, McClellan understood how to generate loyalty only from below his authority, not from above himself. The animosity of his key generals to General Pope contributed to the second Union defeat at Bull Run at the end of August, 1862 . Rafuse conceded that McClellan failed to act aggressively in the wake of Antietam. He wrote that “the same rationalist mindset that enabled McClellan to fashion this opportunity also led him to make decisions at Antietam that, though well-reasoned, led him to miss a great chance to destroy Lee’s army. George Meade was clearly correct when he mused after Antietam that McClellan’s generalship would have benefited from ‘a little more rashness. '”66 Historian Stephen R. Taafe wrote: “As evidence began to accumulate that his days as Army of the Potomac commander were numbered, McClellan sought to cut a deal with the Lincoln administration that would enable him to retain some role in the war. On 7 October, McClellan asked Cochrane to sound out Salmon Chase to see if he would support a campaign to promote him to general in chief. McClellan wanted Cochrane to inform Chase that they were really not that far apart on the slavery issue and that as general in chief he could rally War Democrats to Lincoln’s banner.”67 Nothing came of McClellan’s scheme, however. Navy Secretary Gideon Welles later wrote: “General McClellan, whom the Democrats nominated as their candidate for president, had the sagacity to see that the party managers at Chicago had been carried away by the vituperative harangues and inflammatory declamations of superficial and disunion speakers; he nevertheless accepted the nomination.” 87 McClellan’s acceptance letter was the high point of the campaign, though it angered Peace Democrats. McClellan used his pen to some advantage for the rest of the campaign but avoided personal involvement. He made only two campaign appearances. Indeed, McClellan proved as difficult a candidate as he had been a general – insisting upon remaining aloof from the campaign.. He told a friend not to send any politicians to visit with him, threatening to “snub” them. 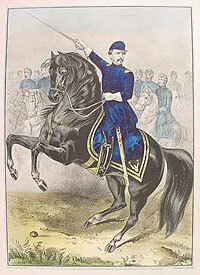 In politics as in war, McClellan played the role of isolated martyr. What really killed McClellan’s candidacy, however, was Union army victories in the summer and fall. Union soldiers voted for their commander-in-chief, not their former commander. Former presidential aide William O. Stoddard visited the White House about the time of the election and later wrote a newspaper report: “We have the news that the reelection of ABRAHAM LINCOLN is a finality, if that word will express my meaning; and the staunchest rebels are slowly beginning to comprehend that by this the door of hope is forever closed upon them. The doom of the Confederacy is thereby sealed, and the great stone of Lincoln’s known policy is rolled across the mouth of the grave where it is buried, nor will any angels ever come to roll it away. Now that the future promises no compromise, and the whole North has again declared its intention to fight this fight out to the bitter end, the dullest and the bitterest are able to see clearly what that end must and will be.”91 By a 3-to-1 margin, soldiers who voted in the field rejected their former commander and supported their commander-in-chief. While the war continued, General McClellan sailed off for Europe. Michael Burlingame, editor, Inside the White House in War Times: Memoirs and Report of Lincoln’s Secretary: William O. Stoddard, pp. 63-64. Ethan S. Rafuse, McClellan’s War, p. 75. Allen Thorndike Rice, editor, Reminiscences of Abraham Lincoln, pp. 201-202 (Lawrence Weldon). Stephen W. Sears, George B. McClellan: The Young Napoleon, pp. 142-143. William C. Davis, Lincoln’s Men, p. 61. Michael Burlingame, editor, Dispatches from Lincoln’s White House: The Anonymous Civil War Journalism of Presidential Secretary William O. Stoddard, pp. 21-22 (August 19, 1861). Stephen W. Sears, editor, The Civil War Papers of George B. McClellan: Selected Correspondence, 1860-1865, p. 70 (Letter from George B. McClellan to Mary Ellen McClellan, July 27, 1861). Richard Striner, Father Abraham: Lincoln’s Relentless Struggle to End Slavery, p. 145. Joseph Glatthaar, Partners in Command, pp. 57, 60. Michael Burlingame and John R. Turner Ettlinger, Inside Lincoln’s White House: The Complete Civil War Diary of John Hay, p. 29 (October 26, 1861). Ethan S. Rafuse, McClellan’s War, p. 5. Richard N. Current, The Lincoln Nobody Knows , p. 140. Stephen W. Sears, George B. McClellan: The Young Napoleon, p. xii. Mark E. Nelly, Jr., The Union Divided: Party Conflict in the Civil War North, p. 81. Kenneth P. Williams, Lincoln Finds a General, Volume II, p. 479. Michael Burlingame, “Nicolay and Hay: Court Historians”, Journal of the Abraham Lincoln Association, Winter 1998, p. 3 (Letter from John Hay to John G. Nicolay, August 10, 1885). Stephen W. Sears, George B. McClellan: The Young Napoleon, p. xi. Ethan S. Rafuse, McClellan’s War, p. 2. Ethan S. Rafuse, McClellan’s War, p. 1. Thomas J. Goss, The War Within the Union High Command, p. 54. John G. Nicolay and John Hay, Abraham Lincoln: A History, Volume V, p. 362. Timothy D. Johnson, Winfield Scott: The Quest for Military Glory, pp. 230-231. James A. Rawley, Abraham Lincoln and a Nation Worth Fighting For, p. 67. Stephen W. Sears, George B. McClellan: The Young Napoleon, p. 110. Ethan S. Rafuse, “Typhoid and Tumult: Lincoln’s Response to General McClellan’s Bout with Typhoid Fever during the Winter of 1861-62,”Journal of the Abraham Lincoln Association, Winter 2003, p. 5 . Michael Burlingame, Lincoln’s Journalist: John Hay’s Anonymous Writings for the Press, 1860-1864, November 2, 1861, pp. 128-129. Doris Kearns Goodwin, Team of Rivals: The Political Genius of Abraham Lincoln, p. 379. Joseph T. Glatthaar, Partners in Command, p. 65. Montgomery C. Meigs, “The Relations of President Lincoln and Secretary Stanton to the Military Commanders in the Civil War”, American Historical Review, Volume XXVI, pp. 292-293. Ethan S. Rafuse, “Typhoid and Tumult: Lincoln’s Response to General McClellan’s Bout with Typhoid Fever during the Winter of 1861-62”, Journal of the Abraham Lincoln Association, Winter 2003, p. 9. Ethan S. Rafuse, “Typhoid and Tumult: Lincoln’s Response to General McClellan’s Bout with Typhoid Fever during the Winter of 1861-62” , Journal of the Abraham Lincoln Association, Winter 2003, p. 16. Frank Abial Flower, Edwin McMasters Stanton, p. 138. John G. Nicolay and John Hay, Abraham Lincoln: A History, Volume V, pp. 168-169. Ward Hill Lamon, Recollections of Abraham Lincoln 1847-1865, pp. 202-203. Robert James Havlik , “‘Lockjaw’: An Early Watergate Coverup”, Lincoln Herald, Summer 2003, p. 55. Richard N. Current, The Lincoln Nobody Knows, p. 141. William D. Kelley, Lincoln and Stanton: A Study of the War Administration of 1861 and 1862, with Special Consideration of Some Recent Statements of Gen. Geo. B. McClellan, p. 22. Michael Burlingame, editor, At Lincoln’s Side: John Hay’s Civil War Correspondence and Selected Writings, p. 20 (Letter from John Hay to John G. Nicolay, April 9, 1862). John Y. Simon and Michael E. Stevens, editors, New Perspectives on the Civil War, Myths and Realities of the National Conflict, p. 62 (John Y. Simon, “Forging a Commander: Ulysses S. Grant Enters the Civil War”). John G. Nicolay and John Hay, Abraham Lincoln: A History, Volume V, p. 364. John G. Nicolay and John Hay, Abraham Lincoln: A History, Volume V, p. 366. CWAL, Volume V (Letter from Abraham Lincoln to George B. McClellan, April 9, 1862), p. 184. Don Carlos Seitz, Lincoln the Politician, p. 292. Bruce Catton, This Hallowed Ground, p. 137. Stephen W. Sears, George B. McClellan: The Young Napoleon, p. 181. Stephen W. Sears, George B. McClellan: The Young Napoleon, pp. 213-214. Bruce Tap, Over Lincoln’s Shoulder, pp.156-157. Ethan S. Rafuse, McClellan’s War, p. 394. Mark Grimsley, The Hard Hand of War: Union Military Policy Toward Southern Civilians, 1861-1865, p. 67. Thomas J. Goss, The War Within the Union High Command, p. 155. Richard J. Carwardine, Lincoln: Profiles in Power, p. 205. Mark E. Neely, Jr., The Union Divided: Party Conflict in the Civil War North, p. 75. Don E. Fehrenbacher and Virginia Fehrenbacher, editors, The Recollected Words of Abraham Lincoln, p. 313. Matthew Pinsker, Lincoln’s Sanctuary: Abraham Lincoln and the Soldier’s Home, p. 55. Winston S. Churchill, The Great Democracies, p. 161. Michael Burlingame, editor, Abraham Lincoln: The Observations of John G. Nicolay and John Hay p. 113 (From John G. Nicolay and John Hay, Abraham Lincoln: A History, Volume VI, p. 185-189). Rufus Rockwell Wilson, editor, Intimate Memories of Lincoln (William Osborn Stoddard, pp. 233-234 (Atlantic Monthly, February-March, 1925). Stephen W. Sears, George B. McClellan: The Young Napoleon, pp. 283-284. Stephen R. Taaffe, Commanding the Army of the Potomac, p. 53. Francis Fisher Browne, The Every-Day Life of Abraham Lincoln, pp. 529-530. Ethan S. Rafuse, McClellan’s War, p. 395. Stephen R. Taaffe, Commanding the Army of the Potomac, p. 54. Stephen W. Sears, George B. McClellan: The Young Napoleon, p. 331. Michael Burlingame and John R. Turner Ettlinger, editors, Inside Lincoln’s White House: The Complete Civil War Diary of John Hay, p. 232 (September 25, 1864). Michael Burlingame, editor, Inside the White House in War Times: Memoirs and Report of Lincoln’s Secretary: William O. Stoddard, p. 80. William D. Kelley, Lincoln and Stanton: A Study of the War Administration of 1861 and 1862, with Special Consideration of Some Recent Statements of Gen. Geo. B. McClellan, pp. 73-75. William D. Kelley, Lincoln and Stanton: A Study of the War Administration of 1861 and 1862, with Special Consideration of Some Recent Statements of Gen. Geo. B. McClellan, p. 75. Michael Burlingame, editor, An Oral History of Abraham Lincoln: John G. Nicolay’s Interviews and Essays p. 50 (Conversation with Hon. T. Lyle Dickey, October 20, 1876). Harry Pratt, editor, Concerning Mr. Lincoln, p. 96. Don C. Seitz, Lincoln the Politician, p. 313. William Ernest Smith, The Francis Preston Blair Family in Politics, Volume II, pp. 143-145. Michael Burlingame, editor, With Lincoln in the White House: Letters, Memoranda, and Other Writings of John G. Nicolay, 1860-1865, p. 91 (Letter from John G. Nicolay to Therena Bates, November 9, 1862). Ethan S. Rafuse, McClellan’s War, p. 382. William D. Kelley, Lincoln and Stanton: A Study of the War Administration of 1861 and 1862, with Special Consideration of Some Recent Statements of Gen. Geo. B. McClellan, p. 62. Michael Burlingame and John R. Turner Ettlinger, editors, Inside Lincoln’s White House: The Complete Civil War Diary of John Hay, pp. 132-133 (December 24, 1863). Gideon Welles, “Lincoln’s Triumph in 1864,” The Atlantic Monthly, April 1878, p. 459. Richard Striner, Father Abraham: Lincoln’s Relentless Struggle to End Slavery, p. 236. Mark E. Neely, Jr., The Union Divided: Party Conflict in the Civil War North, p. 159. Gideon Welles, “Lincoln’s Triumph in 1864,” The Atlantic Monthly, April 1878, p. 457. Mark E. Neely, Jr., The Union Divided: Party Conflict in the Civil War North, p. 80. Alexander K. McClure, Recollections of Half a Century, p. 224. Mark E. Neely, Jr., The Union Divided: Party Conflict in the Civil War North, p. 82. Michael Burlingame, editor, Dispatches from Lincoln’s White House: The Anonymous Civil War Journalism of Presidential Secretary William O. Stoddard, p. 246 (November 15, 1864).